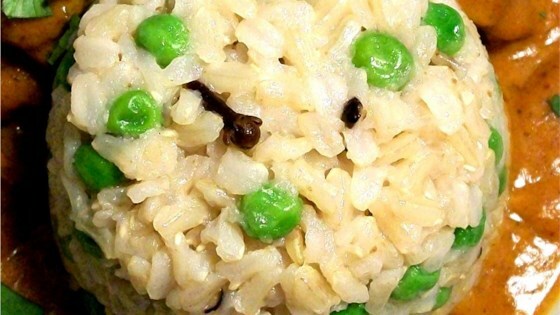 "This is very easy recipe, with basmati rice and green peas. It is very mild and fragrant, and great as a side dish, or for those picky kids who don't like their peas. The word 'matar' means green peas in Urdu." Heat the oil in a deep heavy skillet over low heat. Add the cloves, cardamom seeds, peppercorns and cinnamon sticks. Cook for a few minutes to bring out the aroma of the spices. Stir the garlic powder and 2 tablespoons of water together to make a paste; mix into the pan with the spices. Add the green peas to the pan, cover and cook for about 5 minutes. Add the remaining 4 cups of water and rice to the pan. Season with a little salt. Bring to a boil, then cover, and cook for about 15 minutes, until the rice is tender and the water has been absorbed. Taste, and adjust the salt before serving. I made this recipe the other day, and while it was very aromatic and made my whole house smell AMAZING, it was kind of lacking in the flavor department. Very simple and very tasty. My family is Pakistani, and I think this recipe is quite close to authentic. Fast, easy, and delicious. This fragrant rice dish is an excellent accompaniment to any Indian meal.